There is a mysterious terrorist plot to destroy the human population on Mars using an unknown pathogen. The bounty hunter crew of the Bebop work to find the terrorist and discover the source of the pathogen before the attack can take place. Known in Japan as Cowboy Bebop: Knockin' on Heaven's Door, the movie is a midquel, set between Episodes 22 (Cowboy Funk) and 23 (Brain Scratch). The movie is Shinichirō Watanabe's first feature film directed on his own, though he went into the Cowboy Bebop series thinking about making movies instead of individual episodes. Reviews were mixed, with MetaCritic showing a metascore of 61 but a user score of 8.2, close to IMDb's user rating of 7.9, where there is a decent collection of trivia on the film. 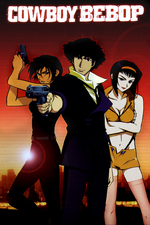 The soundtrack, available in a YouTube playlist and Grooveshark, is similar to the series with a mix of jazz and rock, with the addition of Arabian themes. I only realized now that the entire series of Cowboy Bebop is on Hulu, all in subs and some with English dubs, but I don't see the movie in any official streaming source. Of course, there are some grey-area providers. As someone who had burned through the series quite rapidly before the movie came out State side, it was a gift from heaven to have more Bebop. One thing I appreciated about the film was even though we knew that our crew would generally be okay throughout the movie, the stakes of the film were handled well enough where this knowledge was generally forgotten. When Spike was fighting the villain at the end, it wasn't an exercise in waiting for him to inevitably win, but moments of watching two very well matched men fight. The magic hour color palette at the end was fantastic. The final bit of new Bebop came out with Cowboy Bebop: The Complete Series Blu-Ray (the season, not including the movie) was Ein's Summer Vacation, a minute of still art of Ein, mostly with Ed. Cute, short (1 minute). The feature ends with an eight-minute reading of a scene from episode 11, Toys in the Attic."